In my radico-sentimental revolutionary thingy, which commences immediately the stands have all been cleared of flags, corpses and Monster Energy cans (yeh, right! ), Manu Tuilagi will either be Minister for Transport or Court Jester. But the significant posts in government – such as it is – will be held by Welshmen. Like Gatland, Edwards and Howley. For quite simply they have earned it, having shown leadership, guts and a flair for the inspiring word that nobody in the world (I mean this tournament) could match. They have, to paraphrase the great Confucian scholar bowlingatvinny, utterly and invincibly demonstrated how true encouragement of the truly gifted is both the essential function and the highest aspiration of coaching. That this infers an exchange of an essential trust is (only) a reflection of the need for generous hearts in the pursuit of achievement. So much of life, it seems, is about opening up. My surreal meritocracy – administrated with libertarian aplomb from Machynlleth and let’s say… Grimsby – would certainly feature billboard poster-size recognition for a whole list of flag-bearers for natural expression through sport. Tuilagi’s easy but devastating bursts might have him on the metaphorical bench – in the same way that after this morning’s semi Barnes and O’Connor from the Australian backs warrant squad places – but the bloc itself is surely justifiably red; as in dragons; as in blood; as in heart. This is my elegy to all that redstuff flooding often majestically this last month across the consciousness of the Nations – not Six, not Tri, but many, many nations. The Rugby World Cup is drawing to a close, an appropriately worldly close, in the sense that the ferocious and surely unbeatable South (NZ) play the strangely unloved North (France) this weekend. Circumstances have to some extent conspired for the French – a hugely contentious decision effectively gifting them their semi-final against the adored Welsh – but they have both comically and cynically fallen on their own onions too, to befuddle or bore a way through. It’s a final with only one winner and a fall guy already being slated in confident anticipation of a hopelessly inept appearance. Ali versus Bugner, perhaps? In fact to slalom at least a tad nearer to the point, it’s a tournament already over; the main stuff already learned; the inevitable slight anti-climax of the third place play-off played out. Whilst we now hope for a stunningly climactic exhibition of 15-man rugby from the mighty All Blacks we are not so naive as to expect it. No, we expect a relatively nervy, relatively tight final, in which further proof lumbers out of the ability of ballistically charged ‘modern’ defence to deny attacking patterns (and, incidentally, the crowd) the oxygen of excitement. France will hold out for long periods and maybe even break out. In their exasperation the AB’s will knock-on passes previously clasped whilst juggling four other passes, whilst asleep. The crowd will get restless until the dam finally bursts, in about the third minute. (If only). It could be either a close(ish) non-event or the most one-sided sporting event since Davide and Goliath. Please god deny Davide his sling. The rugby world – the political world, the realworld! – wanted a Wales New Zealand final. As soon as the Welsh began to rise (which may have been pretty early in the South Africa game) the thing perked up. In contrast to the dour and disgraced English and the shambolic and disloyal French, Warburton’s posse planted a flag of brilliance and heart. Their spirit and their youth drove them irresistibly past a resurgent Ireland to their fateful date with the moment most of us will remember most keenly from this event; that tackle. A million words have been spent on the subject so I will find three more only; it felt wrong. On his punishing warm-down jog (three times round the southern hemi) to the SOUNDBITE training ground, Sam Warburton will have no doubt have seen posters from the old regime saying “Warburton – the new McCaw”. In truth, the Wales skipper is such an outstanding athlete that McCaw may yet look one-dimensional in comparison. Over the natural span of a match, he is so often the difference at key phases – whether offloading, at the shoulder, or in the bone-crunching meat and drink of the breakdown – that many of us feel he would have not merely thrown a blanket over any (presumably accidental) French attacking notions, but quite feasibly effected the critical break himself. When they lost him at the 17 minute mark Wales were closer to being down to 13 than 14 and despite the gladiatorial brilliance of Phillips and Roberts amongst others, the reds were trussed up by the Lilliputian French. But the tournament had already been graced by stellar performances from Halfpenny, North, Faletau. The world applauded as the current for allegedly “winning rugby” was stemmed, turned and embarrassed by (let’s hear it, let’s applaud it!) Welsh belief in skill over stats. 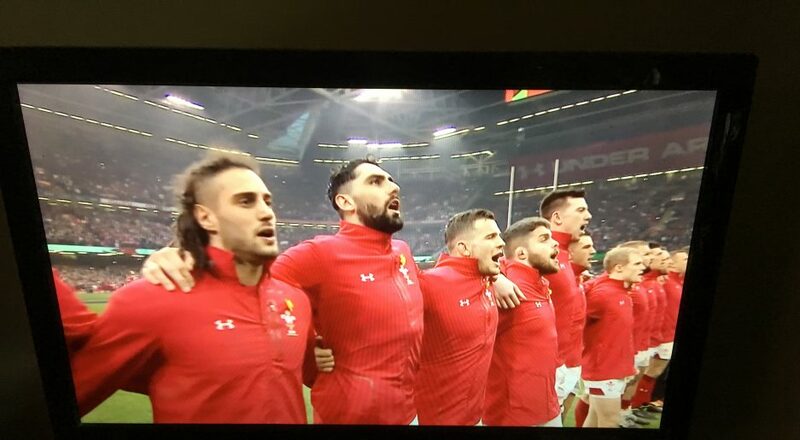 Sure Gatland, Murphy, Howley did the preparation – better than everyone – but then, critically, their liberated posse played better than everyone. Until that moment. That ideal final may have served only to undermine the quality of ecstasy served up by Phillips and co. but hands up those who would’ve bellowed their support for a Welsh final opportunity. Certainly there is a consensus that a Brotherhood of Redness might have at least offered a real challenge to the wonderful and mighty bastards in the black. (No offence – imperfect gag). Instead the hamstrung realist – poor sod – is left with the relative disappointments of a comfortable Australian win, in a bronze-rated, atmospherically flattish game which finished with a brilliantly irrelevant try for My Little But Magnificent Pony. Maybe that’s a disservice to the excellence of Barnes and O’Connor in particular, who may consider themselves honorary Lions in the new Red Occupation. Stonking tackling was not, in truth, the only thing these game Aussies brought to the party. But let’s be clear; it was a match that didn’t matter that much in a tournament illuminated by the positivity and generosity of the Welsh. < Previous Let sleeping gods lie?